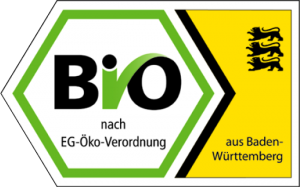 Startseite » Bio-Zeichen BW » What is the biolabel? The biolabel of Baden-Wuerttemberg is a quality seal for organic products grown and processed according to both the legal requirements of the EU Eco Regulation ((EC) No. 834/2007) and to supplementary conditions of the biolabel of the state of Baden-Wuerttemberg. The biolabel makes it easier for consumers to recognise high quality organic products. The biolabel with indication of origin of Baden-Wuerttemberg is a quality seal for organic products grown and processed according to both the legal requirements of the EU Eco Regulation as well as to product-specific supplementary conditions of the biolabel of the state of Baden-Wuerttemberg. Note: The symbol will be changed. The upper new logo will be implemented as of August 2016 and will gradually replace the current one. The participation in this quality scheme is generally open to all businesses of the agricultural and agro-industrial sector of the European Union. Thus, the following options of the biolabel with indication of origin outside of Baden-Wuerttemberg could be feasible as well. The quality seal defines products which are grown and processed according to both the legal requirements of the EU Eco Regulation as well as to product-specific supplementary conditions of a defined region of origin outside of Baden-Wuerttemberg (such as Rhineland Palatinate, France). The use of the quality seal may also be authorised without indication of origin. The biolabel without indication of origin is a quality seal for products that are grown and processed according to both the legal requirements of the EU Eco Regulation as well as to product-specific supplementary conditions, but which will not be categorized to a certain origin. The agricultural businesses must operate 100 % ecologically. The person responsible for production must have a proof a completed agricultural training. More stringent provisions regarding livestock number and use of permitted organic fertilisers apply. The largest proportion of the feed used must stem from the business’s own production. Ruminants must be given enough green forage. Animal keepers must conclude a care contract with a veterinarian. The animal transport time to the slaughterhouse is restricted to a maximum of four hours. Fruit and vegetables must meet either Class Extra or Class I in compliance with the EU marketing standards or UNECE standards. Higher quality requirements apply for beef and veal, pork, lamb and poultry meat. Monoproducts designated to a region of origin, such as potatoes or meat, must be produced according to the requirements of the biolabel from that designated region. For processed products, this applies to the ingredients stated on the product label. In total, at least 90 % of the recipe components in processed products must comply with the requirements of the origin. Animals must be raised and slaughtered in the designated region; specific regulations apply to brought-in animals, such as piglets. The legally responsible owner of the biolabel is the state of Baden-Wuerttemberg, represented by the Ministry of Rural Affairs and Consumer Protection (Ministerium für Ländlichen Raum und Verbraucherschutz; short: MLR). The owner of the label is responsible for the content and further development of the label. The owner also decides on licensing. Provided that no contractual agreement can be concluded between a member state or a region within the EU and the MLR, the latter will issue licences upon request directly to licensees located in the relevant regions or member states. Upon request, the MLR awards the right to use the biolabel by means of a license agreement to organisations, associations or alliances in production and marketing of ecologic products of the agriculture and agri-food industry, who are able to provide monitoring of the label’s use regarding the applicable provisions. Currently, the following licensees are listed for the biolabel Baden-Wuerttemberg. Users of the trademark are businesses of the agricultural and agri-food sector that utilise the biolabel towards the consumer. For this purpose they conclude a trademark agreement with a licensee and will hence be integrated into the quality assurance and control system. They agree to comply at all times with the biolabel’s rules and requirements during production, processing and marketing. At present, approximately 200 users of the biolabel Baden-Wuerttemberg are listed for their products (as of July 2016). Businesses interested in the use of the biolabel shall inquire in writing to one of the licensees. The employees of MBW Marketinggesellschaft will be happy to provide you with more information. Producers are businesses producing agricultural goods for use of the biolabel (with according trademark users). They agree to comply with the biolabel’s rules and requirements in their agricultural production at all times. As a producer, how can you participate in the biolabel Baden-Wuerttemberg? Producers submit a statement of participation through a trademark user towards the licensee and will hence be bound by contract into the quality assurance and control system. In Germany, the general control system for organic farms consists of a governmental monitoring authority and authorised private control institutions. All organic agricultural farms are inspected at least once per year. This is the basis for the control system of the biolabel Baden-Wuerttemberg. The specific requirements for the biolabel will be inspected simultaneously with the organic control by the same control institution. For this purpose, the monitoring authorities dispose of elaborated control checklists and inspection instructions. Synergy effects are then exploited and costly redundant controls avoided. The whole control system of the biolabel Baden-Wuerttemberg is monitored by the MBW Marketinggesellschaft mbH on behalf of the owner of the seal. Hence, the control of the inspections is ensured. An overview of approved monitoring institutions of the biolabel Baden-Wuerttemberg can be found here.